Whether you have a bent rod, a ballooned tube, or a failed cylinder seal, the cause is likely to be operating your cylinder beyond its intended capacities. Your problems may be exacerbated by using cheap or inferior quality cylinders and parts that can’t perform as promised. You can avoid these problems by using Parker hydraulic cylinders San Jose CA. At Bernell Hydraulics, we can help you find the exact cylinders needed for your unique hydraulic application so that you can enjoy longer cylinder life and better performance. When you purchase piston rod Parker hydraulic cylinders San Jose CA you can enjoy the perks of Zero Leak technology. This technology includes superior rod seals and buffer rings working together to deliver improved performance even on very dry rods. If you can’t find the cylinders you need in Parker’s inventory of pre-assembled cylinders, you can create your own cylinder using their selection of standard sized rods and tubes. 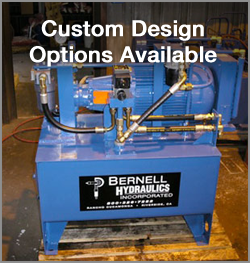 If you need something even more specialized, ask an expert at Bernell Hydraulics about the possibility of creating your own custom hydraulic cylinders. We can modify an existing design to give you the features you want or work completely from scratch. Whatever you need, we will be happy to help.